Both the Anaheim Police Association and the Peace Officers Research Association of California have rejected Santa Ana Council Members David Benavides and Michele Martinez as well as their colleague Roman Reyna, who is in the midst of an ill-advised Mayoral campaign. 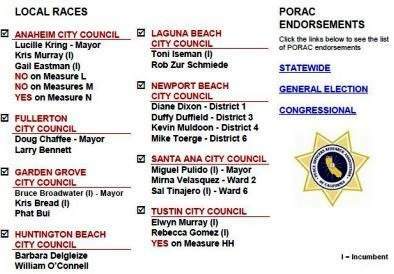 This comes on the heels of rejections of these candidates by the Association of Orange County Deputy Sheriffs. The Santa Ana Police Officers Association (SAPOA) also rejected Reyna and Martinez.